The Lorex Sweet Peek Baby Monitor is more than just a baby monitor – it is an indispensable device for every concerned parent who wants to keep an eye on his child at all times. The device can be fixed or it can be used as a pan and tilt camera, it comes with a generously sized 2.4-inch rechargeable handheld monitor that is lightweight, easy to carry around and that has a battery life of up to 8 continuous hours. This way, you can easily move freely around the house carrying the Lorex Sweet Peek Baby Monitor with you wherever you go, knowing that your toddler is always under close supervision. The monitor will serve as your “portable eyes and ears”, it delivers clear and crisp sound and an outstanding video – there is also a night vision mode embedded in the monitor, if you want to take your baby watching experience to the next level. That being said, this review will pinpoint the pros and cons of this small yet very useful video baby monitor. The Lorex Sweet Peek Baby Monitor is one of the most appreciated video baby monitors on Amazon and other online retailers – and for a good reason, given the fact that it uses a two-way communication system that allows you to both listen to your child and talk to him. Besides this, the video baby monitor also comes with several soothing lullabies that will help the little one fall asleep quickly and easily, even when you are not allowed. 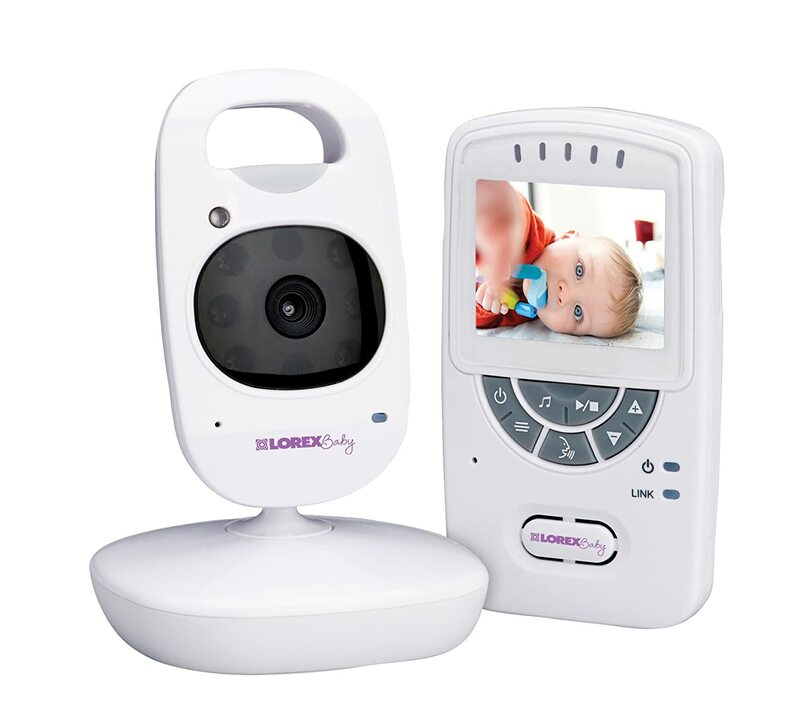 Another important benefit that most parents seem to appreciate when it comes to the Lorex 2.4″ Sweet Peek Video Baby Monitor is the fact that this system is fully expandable, as you can add up to four other cameras to it. This versatile function is great for parents who want to expand their family and to keep an eye on all their toddlers at the same time! Two other very important features are the extended battery life (the battery can be easily recharged whenever needed) coupled with the built in night light located in the wireless camera. This is a very soft and gentle light that will help the little one relax and fall asleep very fast – it is a known fact that some children are naturally afraid of the dark, but fortunately this will never be the case with Lorex Sweet Peek Baby Monitor. Besides this, the wireless camera also comes with a digital zoom feature that allows you to take a closer look at your baby whenever you need! Aside from all the benefits mentioned above, parents have complained about some downsides in particular. Some claim that the monitor freezes up on a constant basis and the device must be restarted on a constant basis, while others say that the night vision is anything but crystal clear. To sum it all up, parents who want to get an affordable and above-the-average video baby monitor should certainly take Lorex Sweet Peek Baby Monitor into consideration, as it is worth your time and your money.